Is there a better way to start the week than with chocolate? I don’t think so and these Superfood Brownie Batter Bites are a staple in my fridge and ready to help me tackle my Monday! Variations of bites like these are staples in my house and have been for years. Usually I have ones for me and other ones for the girls but these are a family favorite we all love. They only require 5 ingredients to make and are super simple. I will grab a couple for a quick bite before barre if I’m not going to eat breakfast and they are perfect for when that craving and hungry strikes in the afternoon. Not to mention a little energy and mood booster when the hangry hits! 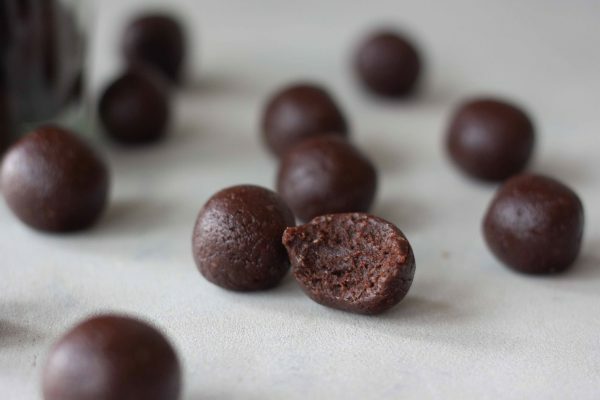 These are actually similar to Chocolate Maca Brownie Bites I posted way back in 2013, Raw Chocolate Cherry Brownies I posted in 2014, and Peppermint Brownie Protein Truffles I posted last December. Tweaking adding maca, cherries, peppermint, and other superfoods depending on mood. I don’t need a reason to eat chocolate and by looking at the ingredients their full of good stuff but I’ll give you a quick breakdown just in case you need a reason to make these and enjoy chocolate. Cacao powder is one of the most powerful superfoods that’s packed with antioxidants, vitamins, and minerals. Great for brain and cardiovascular health, they don’t call it good mood food for nothing. Medjool dates are great for energy and a natural sweetener that are packed with fiber, vitamins, and minerals. Walnuts, the nut I used this time but you can substitute cashews or even almonds, are the richest source of omega-3 fatty acids and also known to aid in reducing inflammation and aiding in recovery. They also contain iron, selenium, calcium, zinc, and vitamins. Also made with Navitas Cacao & Greens (there are substitutions but I’m sharing my personal favorite) so I get complete protein, fiber, digestive enzyme support, probiotics, antioxidants, greens, and superfoods. 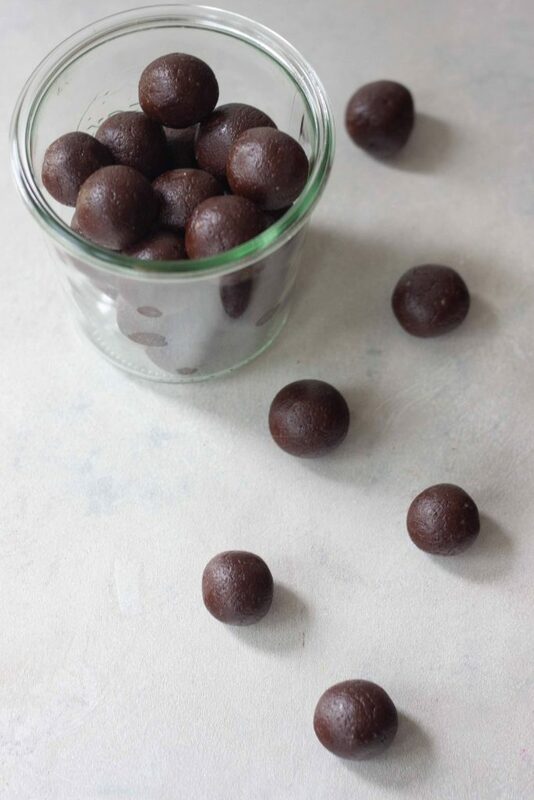 Again not that you need a reason to enjoy these delicious Superfood Brownie Batter Bites! Warning if you don’t want them to disappear you may want to hide them in the back of the fridge. 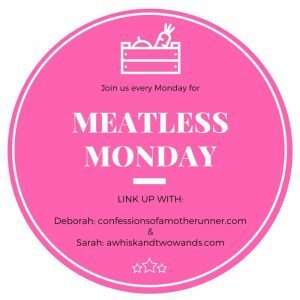 Today is Meatless Monday and I look forward to seeing what’s happening in your kitchen and hope you link up with me and my co-host Deborah and share! I also hope you check out and are inspired by the recipes linked up below. 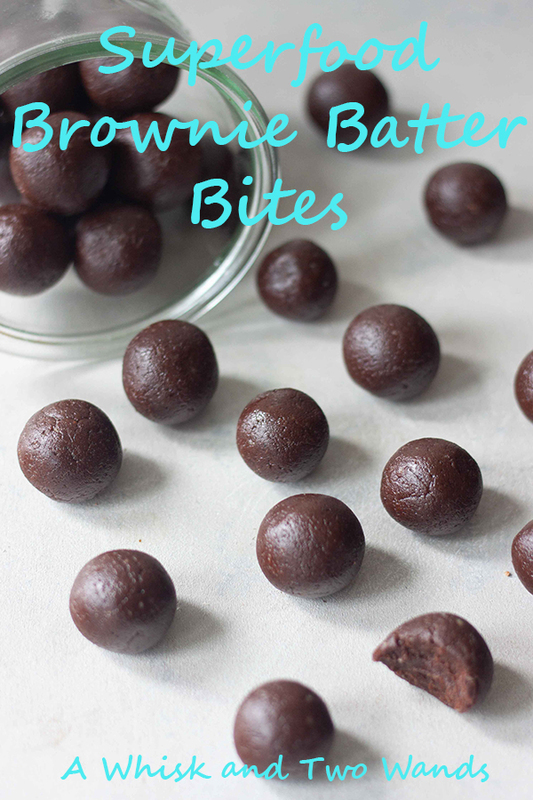 Delicious easy to make Superfood Brownie Batter Bites are healthy and packed with superfoods, protein, probiotics, vitamins, and more! 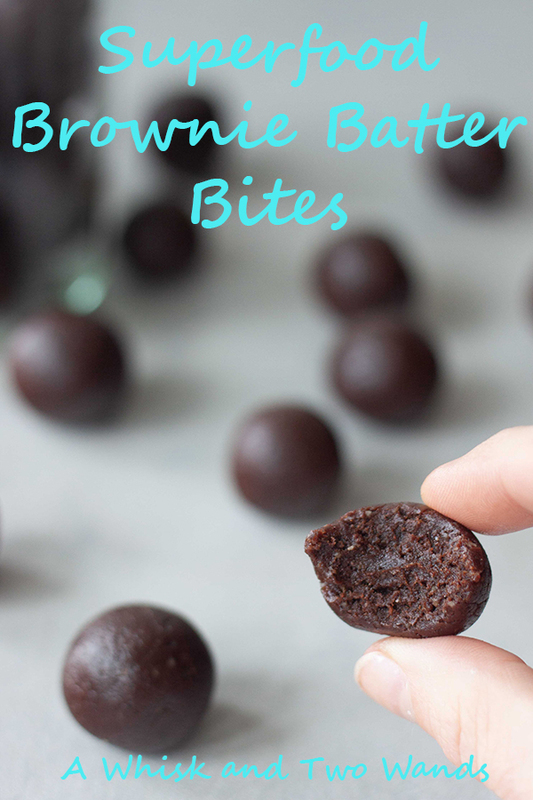 Made with only 5 ingredients they are no bake, gluten free, dairy free, vegan, plant-based, paleo bites that satisfy your chocolate cravings and give you a little natural boost of energy. In a food processor pulse nuts until they are a coarse crumble texture. Add cacao, Cacao & Greens Essential Blend, sea salt, and coffee if using and blend until combine. Drain dates and add dates and blend until well combine, scrapping sides as needed. It should stick together when you pinch it between your fingers. Roll into balls or if making bars line a 8×8 pan with parchment paper and press mixture evenly into the pan. Set in the refrigerator to set, about 15 minutes or until ready to enjoy. Um, I am so making these this weekend! They look so good and just what I need to power me through the first week of school!